OPPOSITION leader Nelson Chamisa, has warned President Emmerson Mnangagwa and government that the high levels of unemployment could lead to yet another civil unrest unless they quickly address the deepening economic crisis. 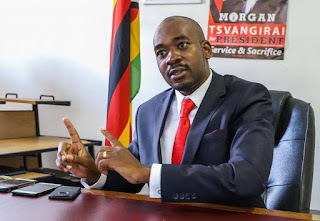 “The plight of young people is a threat to the national stability, youth unemployment is a ticking time bomb that has to be resolved in the context of national dialogue and engagement,” Chamisa said. The youthful opposition leader also said Mnangagwa’s foreign trips appeared to be misplaced “because they were not bringing anything tangible”. “I am getting worried with his trips it seems he is not appreciating the problems that Zimbabwe has, especially the young people,” he said. Mnangagwa, who was feted like a king when he replaced ousted former president Robert Mugabe in November 2017, initially lifted the mood of crisis-weary Zimbabweans who were hopeful at the time that he would turn around the country’s economic fortunes. Information deputy minister Energy Mutodi said Mnangagwa was working hard to attract investors but the opposition was “choosing to criticise him for the sake of gaining relevance”. “The opposition is overlooking what government is doing. We are creating wealth…the president has hosted South Africa and Botswana and travelled to other countries. “The message that we are getting is that we are going to get development partners. We have taken measures towards reducing costs…trying to instil confidence in investors and laying the foundation for them,” Mutodi said. “There is no need for people to demonstrate because demonstrations are retrogressive. We know the opposition want to manipulate every situation to remove the government. “Those in the opposition should know that the law will take its course and those who are on the wrong side of the law will be punished,” he added.